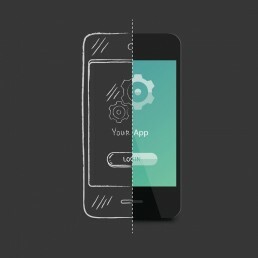 The road to developing a successful mobile application can sometimes be challenging to maneuver, but it starts with a fork—developers have two options: go native or go hybrid. The advantages of each have been debated fiercely and at length, so here, we present a beginner’s guide. Native apps are built for a specific operating platform using a code base that is ‘native’ to either Android or iOS. In other words, native apps are built for either an Apple product, or an Android product, but not for both. By building for a specific platform, the developer has access to faster processing, easier API updates, and inarguably provides a more seamless experience for their user. The programming languages that are used to build native apps are promoted by the platform builders (Apple or Google) themselves. For eg: Swift and Objective C by Apple and Java based Android SDK by Google. User Experience (UX) is the paramount concern in mobile app development. Users who encounter more than one or two negative experiences will often forgo using an app forever. Bottom line: the more complex the application, the deeper the UX, and the more its performance will suffer under the hybrid model. For those who prioritize UX, have time and money to build properly and are dedicated to acquiring and maintaining a loyal user base—the case for native development is clear. 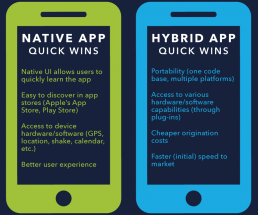 Despite the clear advantages of using native development, a hybrid app also has situational advantages. First, because apps in general are more popular than ever, many good app ideas are being developed by multiple teams at once. If a company is competing for first to market, or is under a lean budget – hybrid is the way to go. Hybrid apps are faster to build out, have increased reach to more potential users, and are less expensive to produce. It’s important to note that the cost advantage is negligible when hybrid developers put a lot of resources into building out a native, such as UX. Open-source development tools and frameworks, such as Apache Cordova, have improved the outcomes of a hybrid approach. Despite these improvements, native apps maintain the clear UX advantage. At Mobile-DI our architects evaluate which app development platform and approach is best for our customers’ needs as part of the tech stack due diligence process. This ensures that there is no throwaway dev effort that wastes time and money. 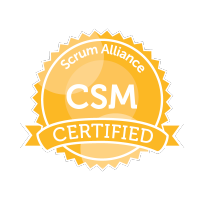 We offer the tech stack due diligence and review service as an Add-on to our MVP starter package. Click below to schedule a time to talk (It’s free) with us to find what would work best for you.